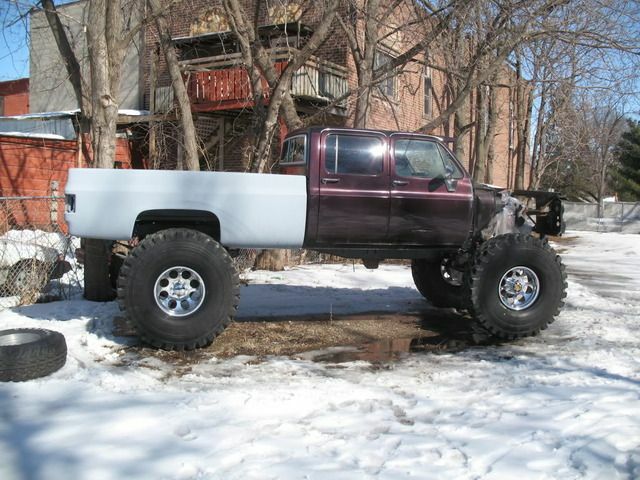 Well it is about time I start a build thread for this truck in the 4x4 section. B.A.D. stands for Big Azz Diesel! I'll start from the begining a little bit. This truck has a long history. So try to hang in with me. Here goes. 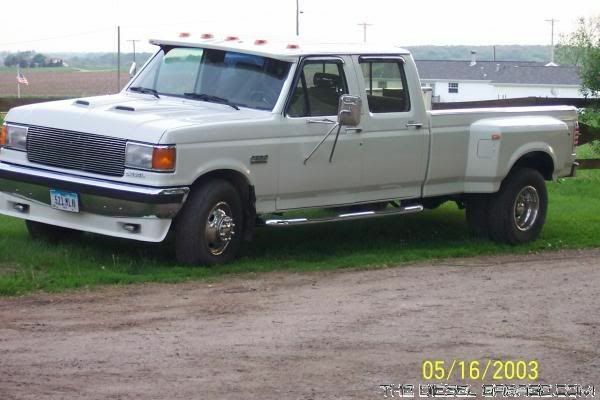 My dad purchased this truck when I was 14 to haul our horse trailer and it was a black and white crew cab dually. It had maroon interior, A/C, hydraboost brakes, and that's pretty much it if I remember correctly. This poor truck was rusted out, bad! Him and I searched junk yards for years grabbing trim and what ever else we could find for this truck. He rebuilt a TH400 it came with and also went through the hubs on the d70. 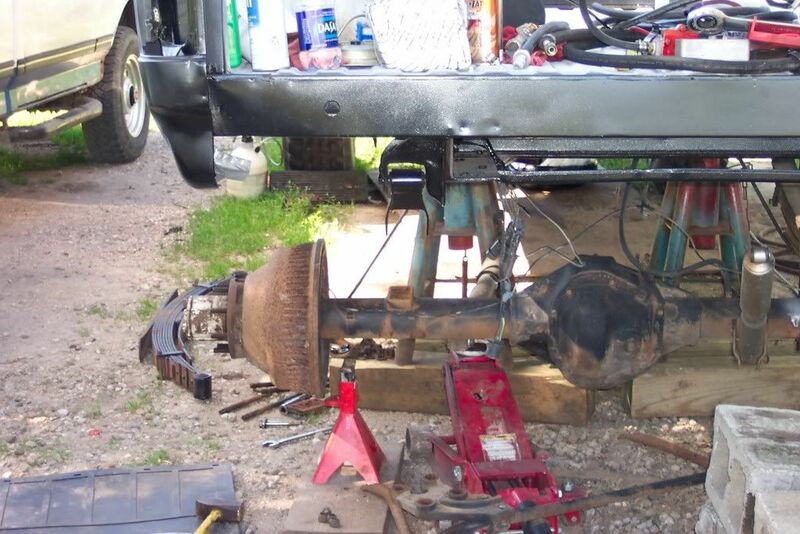 The complete front suspension was new or rebuilt with helper air bags and the works. Nothing was spared on this truck. He purchased a 396 for it and rebuilt it as well. He had it set up really nice. He got a fiberglass front spoiler, lund sun visor, and a razor back for it. All were painted Black cherry metallic like the truck. 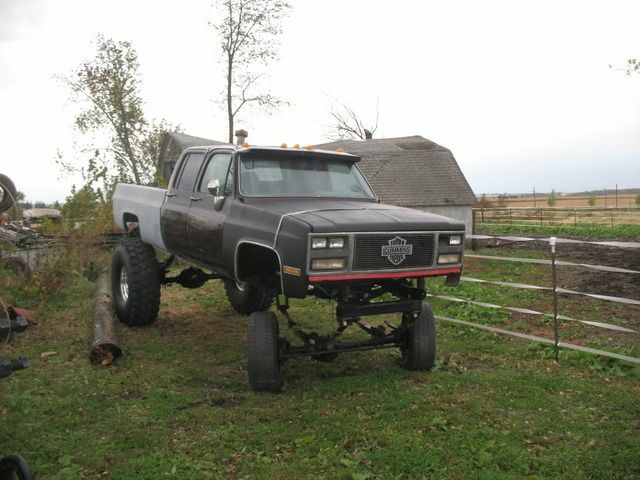 It was a bad azz looking square body! 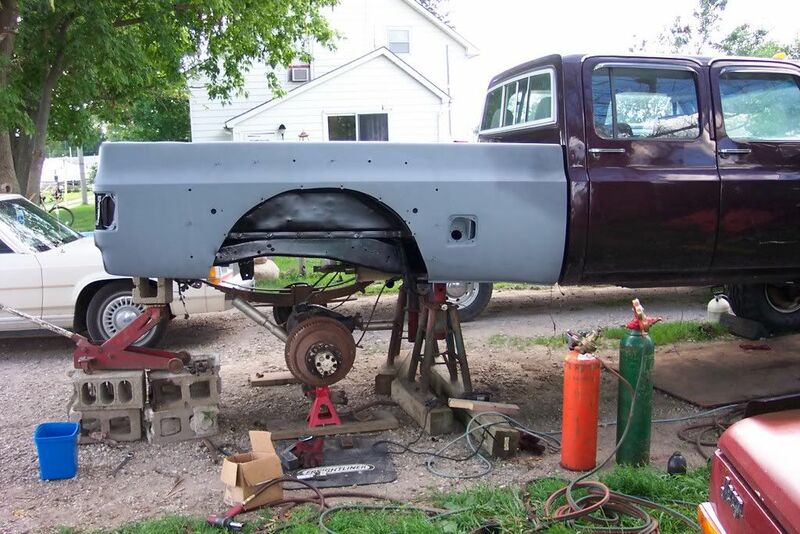 Well once upon a time the truck was real close to being done, cab forward. 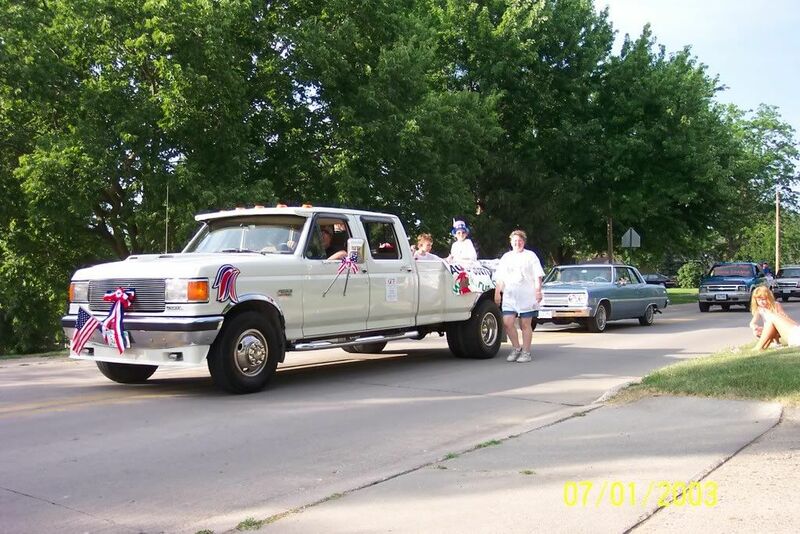 It had to be in 1998 when we were trying to get it done enough to haul our horse trailer to a horse show in Texas. We had it at our friend's body shop where the truck had sat for probabaly 2 years. 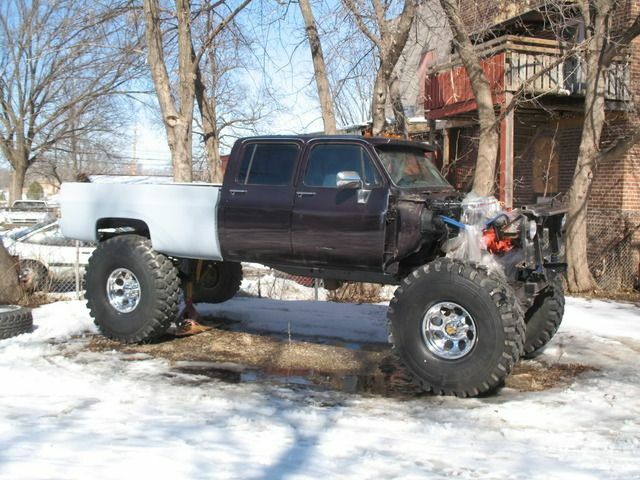 Needless to say the truck didn't get finished. It was running and would drive, but had some wiring gremlins and no interior. My dad got tired of messing with it and got tired of the slow help of the body man and it sat until I graduated high school. It seemed we were always doing the body shop work and his truck never got any work on it, so we brought it home. At that point dad started to want to put a diesel in it because of me. We'd been using my trucks to haul the trailer because his wasn't done. Now my mother was really getting mad. This truck had a ton of money thrown at it and already had a new powertrain. She wasn't happy at all. So I had a 7.3 IDI I ended up with and we started putting it in the truck. It wouldn't fit without huge firewall mods and a body lift so he decided to stop there. I purchased the 396 from him and re-cammed it and stuck it in my 72 camaro. So now here this truck sits with no engine, trans, or box, and mom is seriously pissed. 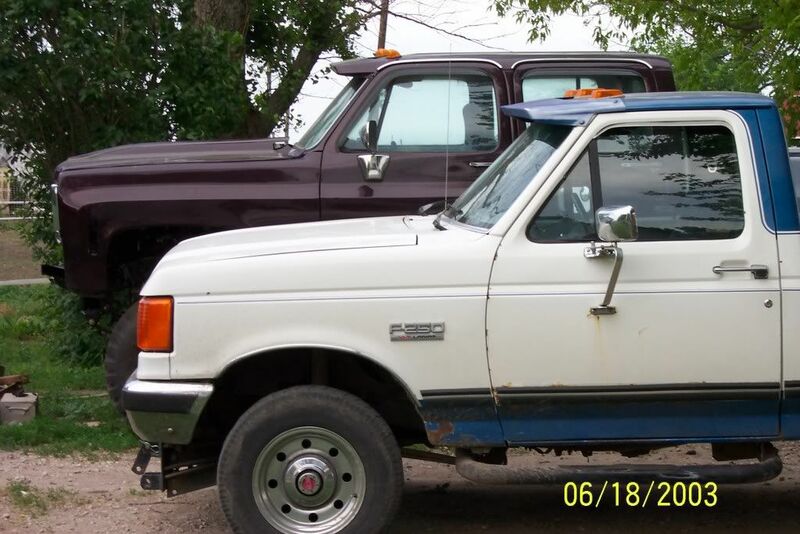 One day I ran across a 91 Ford crew cab, and dad ended up buying it. we took the engine we tried putting in his truck and put it in the ford. Now he finally had his own truck! I purchased his old truck and finally mom calmed down. 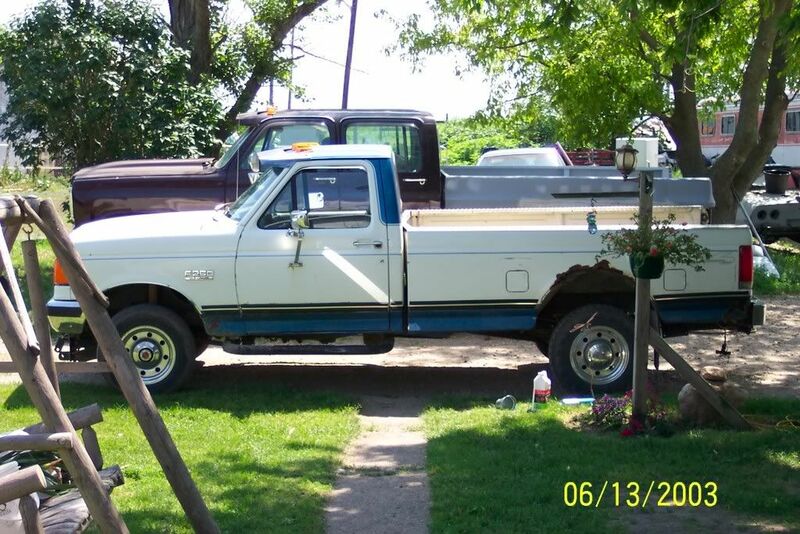 Here is a pic of the new to us ford when we got it done. Ok, so that was a little history on it. Once I purchased it, I decided I was going to make it 4x4. That was a bad idea, because i couldn't stop at a normal level. 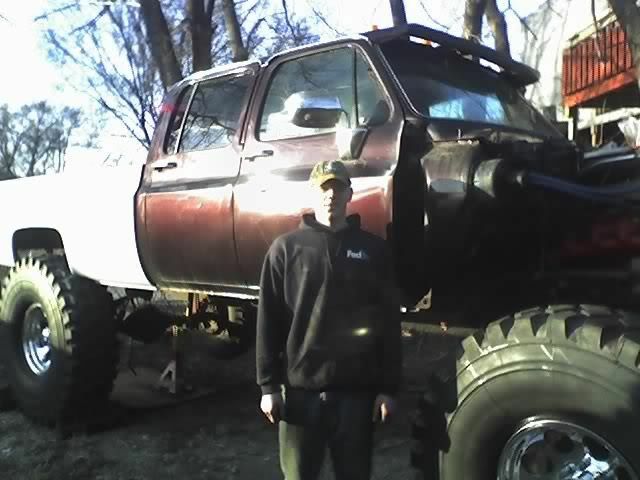 At one time it did have a 4" lift with 33's and was close to drivable. Nowhere near where it is today. Last edited by Dieselwrencher; 07-29-2010 at 05:58 PM. 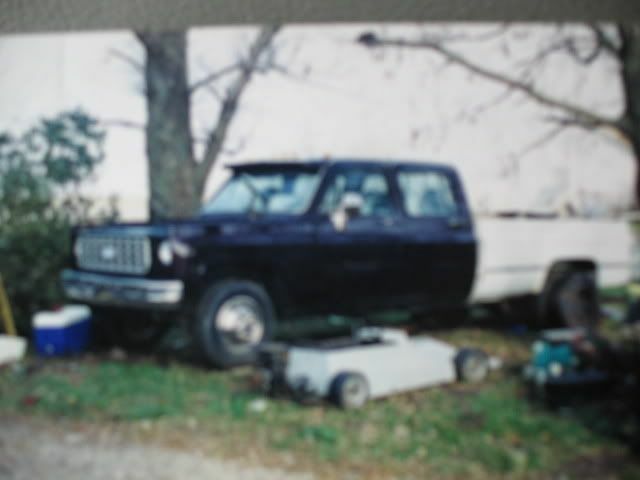 I can't find any really good pics of it as a 2wd but here are some blurry pics from the begining. Back then, 8' boxes were bringing a premium. So being a novice at metal work, I'm not saying I'm a pro now, I purchased some bed patches and I welded all the DRW fender holes shut and installed patches to make it a SRW bed. Boy it sucked. Here is a shot of lifting the rear some more. And here is a shot of one other time when it was drivable, kind of. That last pic it had my 396 with a tunnel ram and 2 Holley 660's. It ran pretty darn hard! 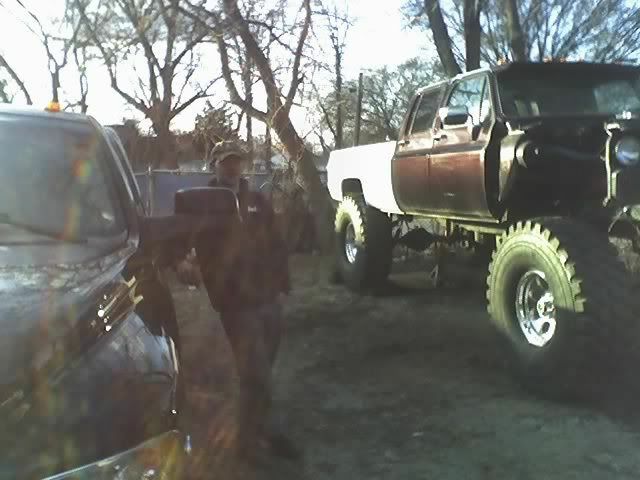 That blue and white ford was my first diesel pick up. That's where the sickness started. The truck went through phases since then. 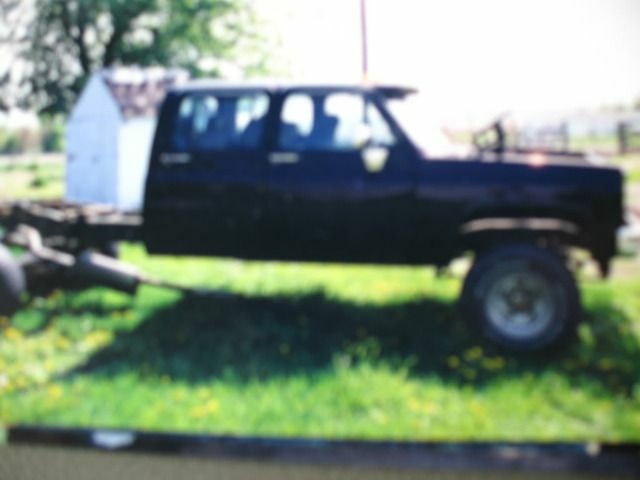 I lifted it more, replaced the box sides with new repo's, purchased a 91 jimmy front clip, got some suburban buckets and consoles, and some small odds and ends. It never really got any attention until 2 years ago or so. I was trying to decide what to do with the truck. It looked dumb with the big lift and 36's. So seeing how I already had 2 daily drivers, and I found a sweet deal on the military tires and M/T wheels, I decided to lift it even more! Here are pics from that. 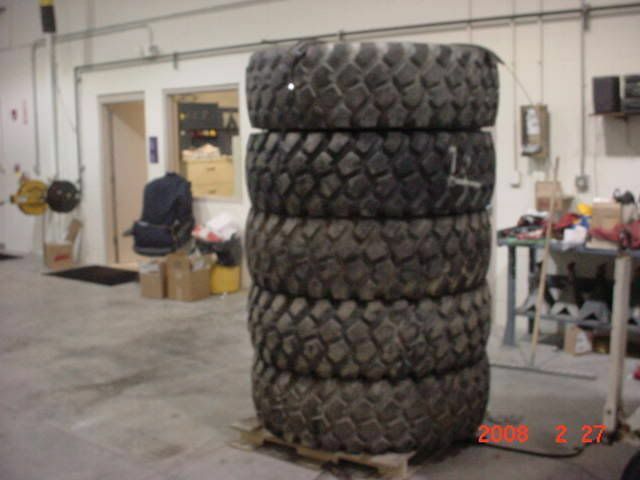 Here is how the tires showed up at my work. 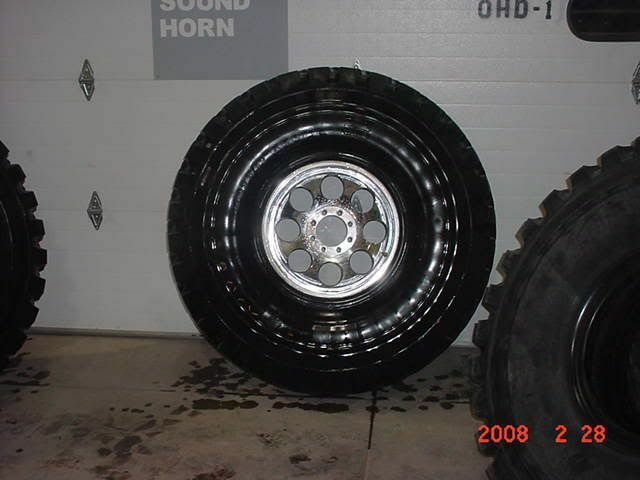 Pic of a tire and wheel mounted up. Here is with the 6" lift springs in front and stock springs with a shackle flip and a 4" block in the rear. My little bro is standing in the center of it for a reference of the heighth. Last edited by Dieselwrencher; 07-29-2010 at 05:33 PM. Steering could be a PITA with this long hauler. Here is with the 12" springs in the front. This was after the front lift and not the rear yet. Here is a pic of how I have to load it and haul it in my trailer. Here are the only pictures I have of it with the current lift on. Last edited by Dieselwrencher; 07-29-2010 at 05:46 PM. So now, maybe I will get this thing drivable?! I have a D60 for the front, I just started gathering parts for crossover steering, I have 2 GM front doors I need to install, I need to clean the interior and re-dye all interior parts, install the seats, mod the firewall for the newer front clip, build drive shafts, and get it running. This time I plan on getting it drivable! Holy hell that thing is huge! Props for all your hard work! Thanks. I still have to come up with some kind of affordable step that lowers and then raises back up. I'm thinking of air bags from a FL70 seat possibly. We'll see. 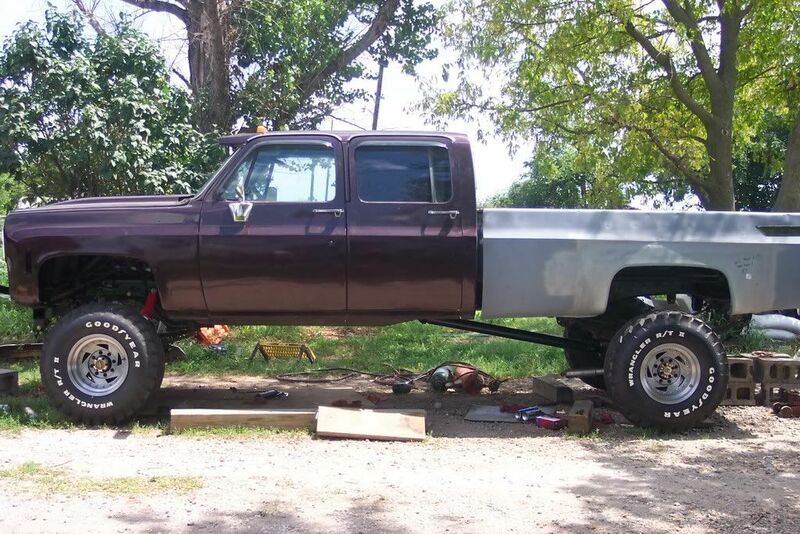 My buddy has a 1984 standard cab short box with stacked frame, 3" body lift and 12" suspension lift. He has 49" Iroks and that little turd has always used the tire to get in it. I have to laugh, I saw him the 4th of July and he was telling me this story that happened to him last fall. 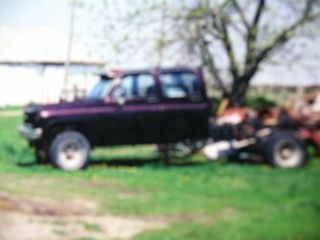 He got a little drunk'd up and decided to go drive the purple truck. He put it in low range, mind you this thing has a healthy 468 with a tunnel ram and dual quads, a TH350 and a NP208. He put it in low range and hammered it at a street corner. He said the tires were turning and then it went pop and there was no go. So he rests it against a curb and then gets out. Steps under it and he figured he threw a drive shaft. Nope, he broke the transmission case before where the tcase bolts on to the adaptor. he goes to get back into the truck and it starts to roll. He said he felt like a circus clown trying to get in it as it started rolling down the road. He finally got in and rolled it down to his dad's place. He told me it scared the holly hell out of him and he may not do that again. Cool truck! 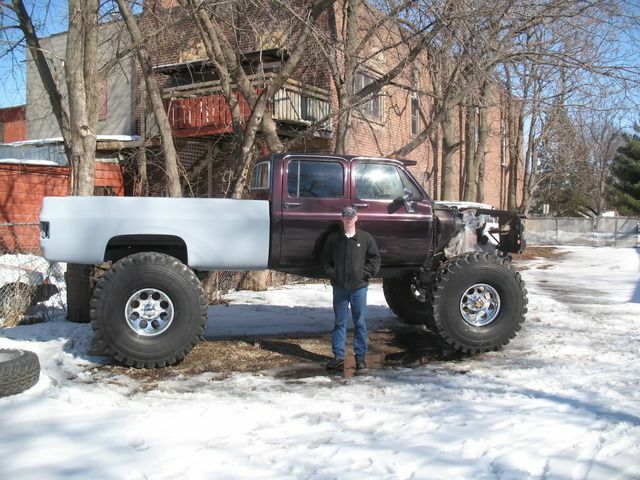 My step dad wants to build one like that or a dually like that some day. 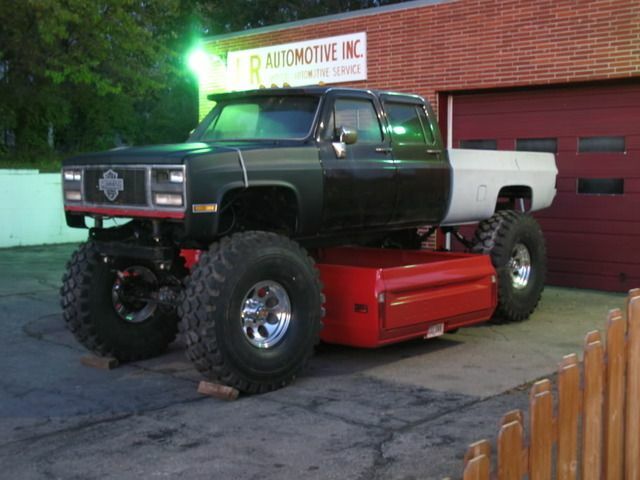 Ok anything lifted is sweet! 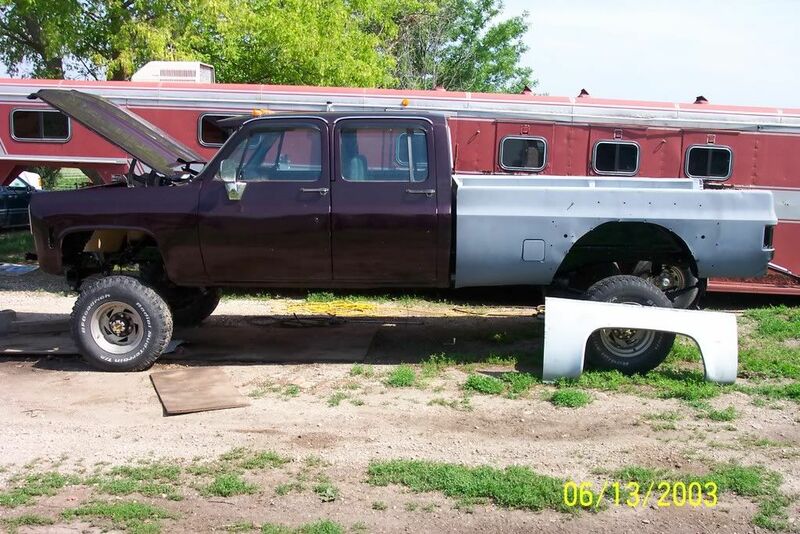 If I had to do it over again, I would have purchased rockwells and made it a dually. But oh well. It's not to late is it? 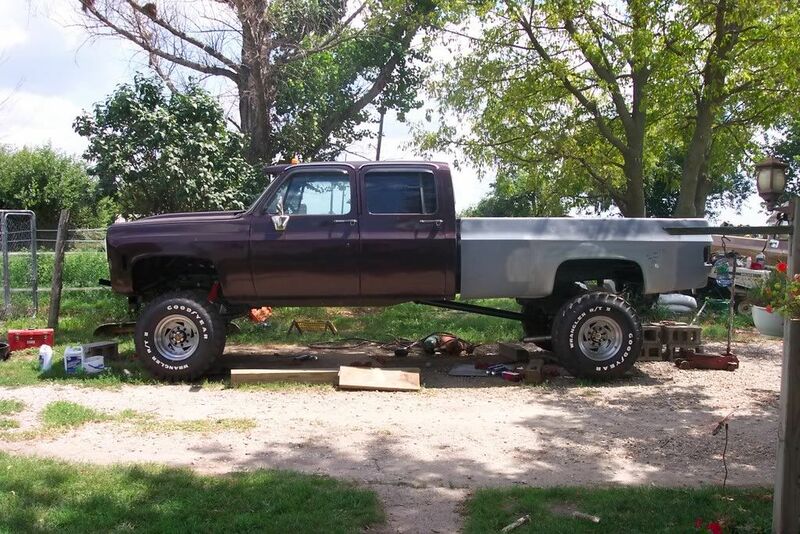 If you haven't sold it rockwells would do that truck well for sure! It would definitely help with the driveshafts too In the last few years those 2.5 tonners sure did get expensive... I used to see working sets for $600 or so, now I'm seeing them over $1000 each! Yep, it's too late. There's no way I'm dismounting these wheels and tires! So I'd have to sell these to be able to get new ones, and I'm not worried about it. This truck will be a parking lot crawler. But I'm guessing I can still wheel it if wanted. If Dana 60 stock axle shafts with spicer forged U-joints will take 800hp diesel sled pulls, it should handle some mild wheeling in this thing. Just don't get it bouncing. Bringing this one from the dead. Hopefully in a couple months this truck will get de-lifted, and made into a usable truck again. I remember reading about this truck a while back on here. It has been a while. What is the new plans for her? Smaller rubbers / less lift? Yes sir. I tried selling the truck with out power train, and had no luck. Next I've been trying to sell the wheels and tires and lift, no luck either. So when ever I have the extra cash I'm going to buy new stock 3 leaf front springs, some 325/85/18's on some 18" wheels, and going to SWB. This will be my wife's new ride. Ya you will get more use out of it then. It is just to big IMO. 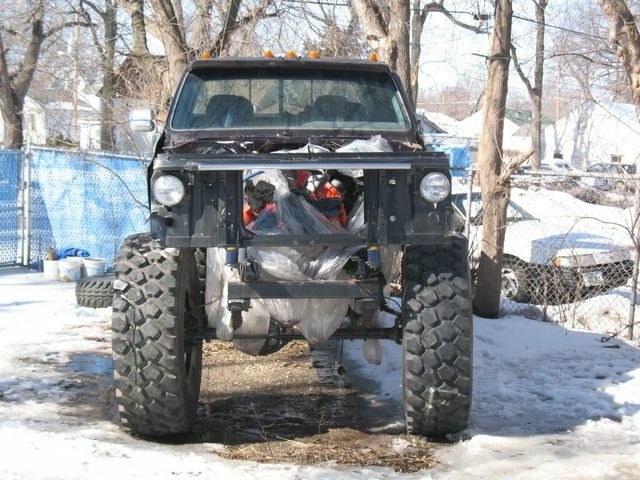 Have you tried selling the lift stuff on other forumns... like pirate4x4??? I bet someone over there would jump on wheels and springs. Yep, the stuff has been on Pirate with no luck either. I cant wait to see progress on this Ryan! Me too. I did score a D70 rear end from a 97 Dodge. So now I just have to decide what trans and tcase to put in it and find the time to get to work on it.